I felt compelled to update this “Best Ice Cleats” post 1 year later. During the past several weeks we’ve been using our STABILicers quite a bit around here. We’ve had our annual ‘January thaw’ whereby some of the snow partially melts into slush and puddles, but then refreezes into a slippery mess. I can reaffirm that these cleats have been simply, AWESOME! We’ve been using them for a few seasons now and they are still performing like the day we bought them! These cleats have held up to some very rigorous duty. I had hoped that they would hold up well given their higher price compared to the typical ‘cheap’ ice cleats that are out there. I’m happy to report that there’s no doubt these will last for a LONG TIME. I have finally found the best ice cleats for my boots! The traction provided by ice cleats on slippery ice and snow is paramount to safety and confidence while walking in bad winter weather conditions. Let me tell you something… All it takes is one fall on the ice or snow and you could break a bone, a hip, or even suffer a concussion. This is serious, so you should take it seriously. Get yourself some cleats for your boots! Over these past winters I have tried several different types of ice cleats for my boots but have always been disappointed for one reason or another (they fall off while walking or the cleats pop off or they just don’t fit well…). Well now I can say that I have found the best ice cleats for my boots which are going to last for many winters to come. And I will wear them more often due to the ease of attaching to my boots. Adjustable Velcro straps for the toe and for the heel make it very easy to get these cleats to fit. Some of my issues with other types of ice cleats include a general poor fit (rubber stretching over the boot – but never seemed to fit securely). Once you’ve adjusted the Velcro toe strap you can just leave it that way. It will slip on and off your boot with ease. What I really like is the rear Velcro strap which wraps around the heel of the boot as pictured. Easy on, Easy off! These cleats are going to stay on the boot and not fall off! Heavy duty full sole supports the boot itself. 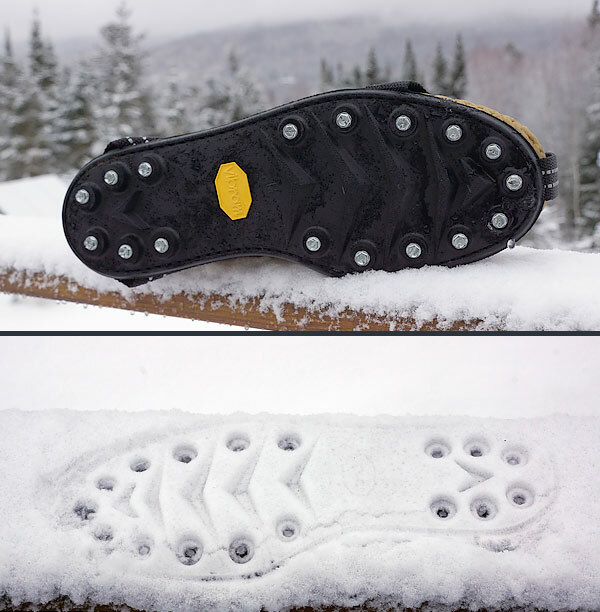 These STABILicers use a proprietary ‘Vibram’ sole design which makes this boot cleat ‘solid’. Unlike other ice cleats, these are designed such that the entire sole (with it’s unique tread) and attached cleats are doing all the gripping work. Your boots simply are strapped to them. When looking for any product it’s good to read about what others are saying. These particular ice cleats have excellent reviews. These cleats are 100% made in Maine! Your purchase will support U.S. workers and their business in Biddeford, ME. TIP: Take ice cleats off if walking on concrete. They tend to slip and cannot gain traction on that type of surface! Common sense: remove while indoors. Ken, you always manage to make things sound really good and make me want to buy them. I swear that nearly every other advertisement falls short, but you are a different story. When I get enough money, I’m probably going to be rummaging through this blog trying to find “Ken’s favourite things”. I do need a pair of ice cleats, but I’m sure there are many more higher priority things to buy. You mentioned these a few days a little while ago, I think, good to have some more information! I have a couple of pairs of YakTrax Pros and have been looking for something a little better — my boot size falls in between the medium and large (and different boots are slightly different sizes), and neither one seems to fit as well as I’d like. Will have to give these a try! I wear a size 11 / 11.5 boot and I chose their ‘M’ size based on their listed dimensions. I could have gone ‘L’, but as you can see by the photos above it fits well. The large size would have been fine too, about 3/4″ longer and slightly wider. Nice looking but ouch! That’s got a hefty price tag, Ken! I’ve used crampons but they have their own set of issues. I later discovered that a pair of boots can be directly ‘studded’ inexpensively by using ice racing screws (originally designed for racing dirt bikes on ice). They work! There are a couple of sizes available. My boots use a 3/8-inch screw set into the sole of the boots. They’re called Kutter screws. And the best part is that they’re only about 15-cents each! There’s also the regular wading boot studs but they’re much more expensive. Of course, the negative to having this done is that the boot becomes ‘dedicated’ to river-wading or ‘ice walking’ and your strap-ons are a temporary fix. If a person has an old pair of hiking/wading boots, the screws are the least expensive fix, imo, which is what I rigged up. One thing that I’ve learned in life is, “You get what you pay for” (usually). My previous ice cleats had cost me about $15 (I tried a few different types in this price range) and they were a failure. Darn cleats would pop off. The entire thing would also occasionally slip off my boot. Traction was not comparable at all. My traction safety on ice is especially important. I know people who have been seriously injured falling on ice and slippery driveways. It’s not pretty. What’s your hip worth? I keep a pair of ice cleats permanently on one pair of boots. They work great. Then one day I was walking to a car parked inside a garage and slipped. The concrete floor had been painted. The cleats slid right out from under me. Lesson learned. Well I don’t think they even sell these in any stores around here. haha. Hardly any ice days. When there is, we just shut everything down. Texans don’t deal with ice. We are all crying today, it was in the 30s this morning, the high will be in the 50s. Brrr.. we had to turn on our heat last night. Very cold today. I assume that was southern humor! You have to travel north and experience some 10 to 20 below zero with 20-30 mph wind chill, invigorating! I worked two winters on the North Slope where 20 below was a warm day. At 40 below we had to stop flying our helicopters since the cold would make the metal brittle and could crack in flight. I have several different styles of ice cleats including the hex head type. WARNING take them off on smooth concrete floors or when you go into the grocery store. As a side note in 1965 when I turned 16 and living in PA. I purchased a new set of recapped snow tires with very deep logs. I went to the hardware store and bought some small hex head screws and put them into the lugs of the tires. Surprisingly they did stay into the tire. Years later someone invented studs for tires. We used to do the same on our 4wd tires! The family owned a sheet metal Shop so 1/4″ screwes were plentiful. We’d put them every other lug on the outer edge of the tread. Back in 70 what ever durring the big blizzard we had no troubles getting around. The 4wd club worked with the highway patrol and would go out to help people that were stuck or needed evacuated. This is a timely article as I was snowblowing my driveway just the other day and took a pretty good fall after stepping on some ice that was under the fresh snow. Fortunately, I’m still young enough that all I got out of it was a weeks’ worth of soreness. It could have been much, much worse as I lost complete control of the snowblower when I went down. Luckily I was on a slope and the ice took the snowblower downhill away from me. Had I broken anything I would have been laid out until my wife wondered why I hadn’t come back in. Lying in ice and snow for an hour with a broken back is no way to start the morning. I made ice cleats from scrap SS sheet metal and SS sheet metal screws, both acquired for free. I did have to spring for a 1/8″ cobalt drill bit to drill pilot holes (without having to drill verrry slowly and use lots of lube). Naturally, the points are toward the ground, so they cannot be used on anything dry except bare concrete. I used paracord to tie these to my boots. Carbon steel could be used, but will rust. Nice! I’m in NH too, and just caught a fall on the messy ice crust cover we have right now. Wearing decent boots that normally are fine paired with caution, but these look great. I havent had good luck with inexpensive cleats either. Timely article! Having had to do the “ice dance” while holding onto the snow blower a few days ago, on our very wide(and steep) driveway, the Yaktrax my daughter suggested, only added to the Pregnant-Polar-Bear-Dancing, I treated the neighbors to…. After breaking a knee cap vertically in July 2016, my OrthoDoc, told me, “Now come winter, I want you(emphasis on ME) to be extremely careful walking on ice and snow. Ya don’t want to break a hip!” He was alluding to the fact that I’ve got some arthritis starting to show up in the joints (age related and youthful indiscretions), so, I can “appreciate” being able to NOT have to do the “ice dance” on the blasted driveway. Of course, I didn’t get the thermonuclear powered snow blower, (cheap and foolish decision) so, I’m “on the ice” a lot this winter of more “normal” snowfall. Have 14 feet only piled up by the snow plow at the end of the road in our front yard. We are in the Intermountain West, and the snowfall is being classified this year as “more normal”. Gone through 150lbs of Ice Melt already and the “season” isn’t over by a long shot….gotta order me some traction helpers tomorrow. Oh, yeah, forgot to mention the street is ALL downhill from my driveway, so I could theoretically if the ice is right, end up a block or so (in distance away) when I slip and fall again….Yeehaw! Finally got a pair and after two days I can say they are outstanding! Just ordered a pair for my wife. Thanks for the tip. Love these cleats! Well worth it! They actually stay on (unlike many others). 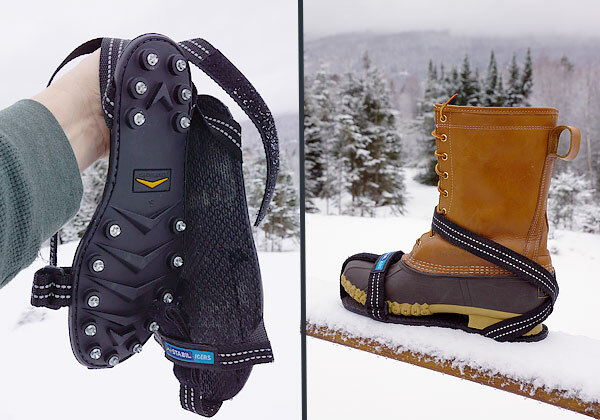 In addition to the DIY ice grippers, I have some YakTrax (not impressed), and IceTrekkers (much better). The rubber part on either seems like a weak link. The StabilIcers look like they would last longer. The Velcro straps wouldn’t be stretched like rubber bands like many other brands, and would still be easy on/off. The extra $20-$25 in cost is cheaper than my health insurance copay, and much less painful than a fall, even if you don’t break anything. This is one of those things most of us don’t need very often, but when we need it, we probably don’t have time to wait for Amazon, even if we sprung for Prime. Here in the Four Corners were in a drought with mid 50 temps. Put them on my Amazon list. This is an item not needed here in the south very often, but an item that I would consider as insurance. It is so nice to finally fit into something called “extra small”! The towns people in Cordova, Alaska used icecleats because no one shoveled their sidewalks and they were all ice. I am surprised no one ever got sued. In Wasilla, Alaska I had a steep driveway to the house and my husband used his golf shoes with spikes to walk on the ice. They worked great. In Ohio, you can’t sue because of slips on ice. It’s now considered a natural hazard (or something like that). I think this changed in the 80s. Some people tried to sue after they fell on a shoveled surface, claiming they thought the hazard had been removed. That got shot down quickly. The change probably came about because the wrong lawyer or politician got sued. Do they hold up well on flip flops!!?? We have gravel all around the house. Last year we took our drag behind the ATV and drug as much property as possible to break up the ice. It was brutal in the redoubt, but only slipped once for a strained shoulder.. This year has been so mild that my daffodils already are budding up. But no guarantees on next years snow and ice so I’ll save these to my wish list. Can,t say enough good about my cleats. I use mine for ice fishing. I could go on and on but for durability, performance and comfort these are top notch. Trust me, get a pair and you will love them. I don,t know why it took so long for me to find THE BEST ICE CLEATS ON THE MARKET!!! Thanks for your opinion James. I went for years with those cheaper ice cleats that you can buy just about anywhere. They kept popping off my boots at random times. Pain in the arss. I agree that the STABILicers are THE best! I’ve had them for several years so far without any negative issues at all. They help keep your feet just a little bit warmer than otherwise. When walking on icy surfaces (e.g. ice fishing, or wherever) those substantial cleats lift you off the ground. Only the cleats are making contact. Less surface area of the cold ground transferring to your boots! 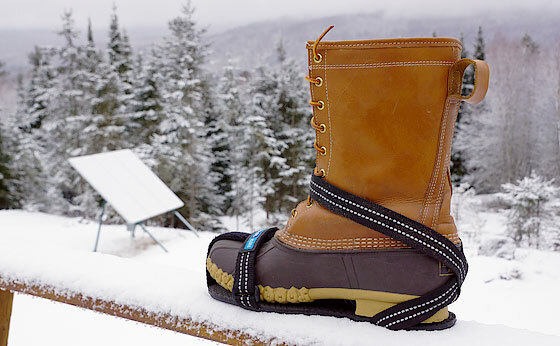 Also, the thick rubber sole is an insulator all by itself.